I know this is about 847 years late, but better late than never, right? Or something. As I reported a while back, Tel Aviv chose to participate in Earth Hour where all lights in the city were going to be turned off. As opposed to the rest of the world cities that participated on Saturday, Tel Aviv actually moved it’s Earth Hour to Thursday because of problems that could arise with Shabbat and to make sure it was effective. At 8 pm, lights in Tel Aviv went out. It was completely dark. Not a light in the city. You couldn’t see your hand in front of your face. Even if you slapped your face. You’d wonder where the slap came from. OK, so I’m slightly exaggerating, but the truth is that Earth Hour in Tel Aviv was a big success. Lights were turned off in almost all the major buildings (i.e. Azrielli and the Iriya) and literally thousands upon thousands of businesses and citizens turned their lights off between 8 and 9 pm. Even at Channel 10 we did our part (sorta). At the top of the 8 o’clock newscast (which begins at 7:58 – don’t ask), Miki, the anchorwoman, ordered our lights out. It’s a cool concept, but we couldn’t see the line ups, so we had tons of mistakes during the newscast. Not really, it went well, actually, and we had enough lights from the monitors. I personally suggested we do the entire newscast without electricity, but for some reason no one else thought it was a good idea. So one after the other, lights went out in the city – an approximate equivalent of 700,000 (!!!) light bulbs were turned off, bringing total wattage saved in Tel Aviv, after all calculations of regular drops in electricity etc. to over 20 megawatts – the same as Sydney last year. FYI – 20 megawatts is equal the gas emissions of 40,000 cars a day (!!!). In Kikar Rabin, some 40,000 people gathered to see the lights of the Iriya turned off by the Tel Aviv Mayor Ron Huldai, and to hear an acoustic version of Knesiat Hasechel’s music. Only the first row could hear. Not really – the concert was powered by a bicycle generator and used vegetable oil, namely falafel oil (I’m not kidding on either counts). By the way, the reason you see some lights on in the building is because 1) some people are idiots and forgot to turn off their lights regardless, and 2) those are mostly hi tech companies, and many people were, most likely, still working. I have a question for my readers (the 10 of you out there): What kinds of things would you like to hear about on this blog? What kinds of updates would you like? Feel free to either leave it in the comments or email me at realisrael [at] gmail.com – the address is on my sidebar as well. 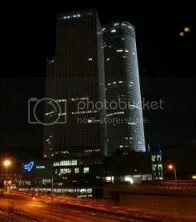 On March 29, 2008, at 8 PM local time (GMT-2), Tel Aviv will go dark for an hour. Tel Aviv has joined a growing list of countries and organizations who have joined Earth Hour, a worldwide campaign meant to reduce greenhouse gas emissions. Earth Hour is the initiative of the World Wildlife Fund and began in Sydney, Australia last March, when the lights in Harbour Bridge and the Sydney Opera House were turned off for an hour, along with 2.2 million Australians who did the same in their home. This initiative alone reduced energy consumption by about 10%. Tel Aviv joins cities such as Chicago, Dublin, Sydney, Toronto, Phoenix, San Fransisco, Atlanta, and Copenhagen. If you’d like more information about how to join the initiative, visit the Earth Hour website. Well strap my face to the side of a pig and roll me in the mud – I didn’t think I’d live to see the day. Next you’ll be telling me that the rockets the Palestinians have been launching at us are actually Piñata‘s and we’ve been forgetting to see what candy is inside. Specifically, Vogue called Tel Aviv exciting and vigorous, and full of style. Clearly parking wasn’t a criteria in grading the city. The magazine recommended four restaurants: Benny Hadayag, Mul Yam, Nana, and the Suzanna cafe, which I’ve totally been to – does that make me cool and French? The Vogue article comes just a few months after New York Magazine named Tel Aviv as one of the best places to visit for a 4-day trip (they didn’t mean the time it takes to get here and back). By a few months, of course, I mean a year. The New York Magazine article mentions Betty Ford (the restaurant, not the clinic or the person) as one of the best places to eat. I eat there all the time – I had lunch there today. Does this make me cool too? Am I going through a revolution? You are currently browsing the archives for the tel aviv category.